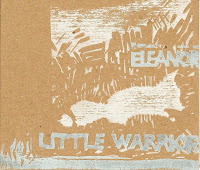 I kind of see Little Warrior, the just-released EP from Olympia folk artist Eleanor Murray, as the release that fans will one day search out (i'm thinking of releases like Modest Mouse's Interstate 8 and Archers of Loaf's Vs the Greatest of All Time). Though perhaps one of the most humble and down to earth people I know, Ms Murray is bound for greatness; anyone who sees her play live is, pretty instantly, a fan and last year's For Cedar (her debut full length) was great from start to finish. Little Warrior is a little more off-the-cuff than For Cedar, though; not necessarily a cohesive album, but loose in the way I feel an EP like this should be. One thing I love about it: she gets weird for a song or two. "The Fox" is a haunting, reverb-drenched, bow screechy mini-epic and the interlude that follows it is a jammy organ thing. There's more of her standard, minimal folk, there's a big epic, and then there's the title track. What starts as a fairly innocuous-sounding folk song builds into an intense hypnosis of rounds and harmonies that makes my mind run marvelous circles. Little Warrior is not yet available on the internet (gasp! ), but only on her U.S. tour with Invisible River that is happening right now. So get out there, catch a show and buy this awesome CD! Tour schedule.